This high-quality functional model of a naturally-sized right joint with ligaments shows the anatomy This functional model provides a graphic demonstration of the anatomy and mechanics of the joint, al This high-quality functional model of a naturally-sized right joint with ligaments shows the anatomy The mini-joint has been reduced to a half of his natural size but has kept all of his functionality. 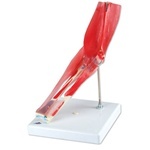 Foot Skeleton Model with Ligaments and Muscles This anatomically detailed model of the foot A life-size plastic hand strung on elastic cord. Muscle origins and insertions are labeled and color The mini-joint has been reduced to a half of his natural size but has kept all of his functionality. The mini-joint has been reduced to a half of his natural size but has kept all of his functionality.